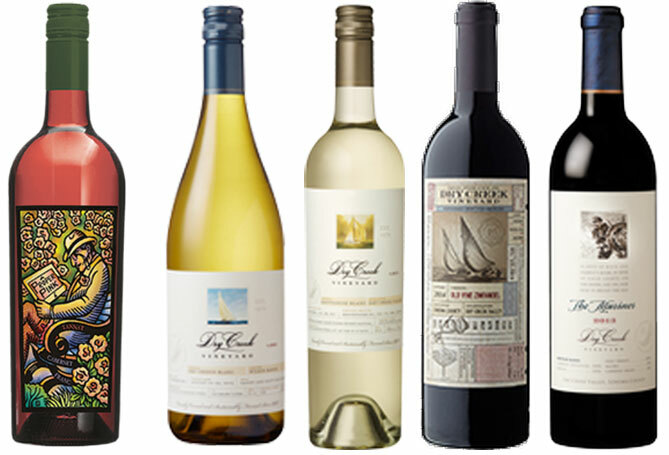 California Wine Country is on vacation for Independence Day today, so here is a reprise of our March 22, 2017 show featuring Tim Bell from Dry Creek Vineyard. We will be back next week with a new show. Cheers! Today’s guest is Tim Bell, winemaker at Dry Creek Vineyard. 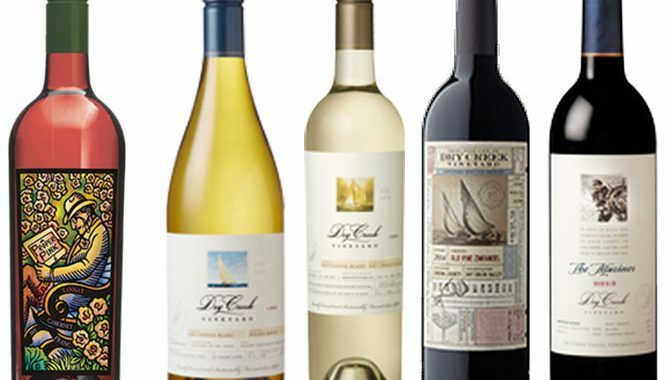 First we taste a very interesting Rosé from Bonny Doon Vineyards in Santa Cruz, then Steve and Dan talk to Tim Bell about Dry Creek Vineyards as they celebrate their 45th anniversary, with tastings of their Chenin Blanc, Sauvignon Blanc, a Zinfandel and a blended red. Dan says that Dry Creek Vineyard and Tim Bell have a real success story, even if Dry Creek does not have as flashy a reputation as it deserves to have. He opens with a tasting of “A Proper Pink” which is a rosé produced by Randall Graham, owner and “king for life” of Bonny Doon Vineyard in Santa Cruz. It is a slightly sweeter rosé. It is made with Tannat grapes, which is a red wine grape, so to make rosé you have to get the skins out of the juice pretty quickly. It is made from 69% Tannat and 31 % Cabernet Franc. It sells for $15 or $16 per bottle. Dan says that it is so flavorful that you could even put ice cubes in it and its flavor would hold up. Chenin Blanc: Dan says this is the best Chenin Blanc he has ever tasted. It used to be popular in California but not there are only a few thousand acres and most of it goes into jug wine. It is a dry style, popular because it has beautiful melon fruit and subtle spices of green tea. Chilling it covers the sugars and gives it a weightiness from the sugar which shows up as texture rather than as sweetness. Bonny Doon’s “A Proper Pink” then 4 bottles from Dry Creek Vineyard: Chenin Blanc, Sauvignon Blanc, Old Vine Zin & The Mariner. Sauvignon Blanc: They were the first to plant Sauvignon Blanc in Dry Creek Valley. Dan says that until the pioneers came along to try different vines, we didn’t know what varieties were appropriate for each region. When David Stare planted Sauvignon Blanc in the 1970s, Dan found that it reminded him of the Loire Valley. Both he and Robert Mondavi adopted the name Fumé Blanc for the wine. Tim says that the Loire Valley was indeed David’s inspiration. He explains the other grapes that go into its blend. Dan mentions the aromatics are fascinating, with hints of chamomille tea. Tim also says he tastes ripe limes.Dan says that this variety has a tendency to show its distinctiveness based on the weather and soil where it is planted. Some regions have green herb flavors, others, do not. Tim agrees, as he has made Sauvignon Blanc from different regions. Dan says that this variety has a tendency to show its distinctiveness based on the weather and soil where it is planted. Some regions have green herb flavors, others, do not. Tim agrees, as he has made Sauvignon Blanc from different regions. Dan discovered this about Sauvignon Blanc, when talking to somelliers in restaurants, that patrons who ordered Sauvignon Blanc ended up spending more money on their checks because they would order two bottles. 2014 Old Vine Zinfandel: This wine comes from a grape that ripens unevenly, which Tim says contributes to its unique flavor. Dan finds flavors of black pepper and mocha, but not woody, but cocoa-like and black cherry and rasberry. Steve finds that it is smooth, and doesn’t slap him in the face like some Zins. Dan says there is a handful of California Zins that deliver this kind of fruit in the $60 range, but this one sells for $38, making it a great bargain value. 2013 The Mariner: This is a Bordeaux-inspired blend. Tim describes the wine as changing from year to year, based on the best available that year. 2013 was an intense vintage for the Bordeaux reds, dark with lots of tannins. So this time he used more Malbec than usual, because it is softer and rounded out the profile. Tim says the winery is getting ready to release some Cabernet Franc, which Dan wants to taste when it’s ready.